Food allergy is the body’s reaction to food products (allergens) caused by stimulation of immune mechanisms in the body. The development of food allergy is determined by genetic factors, environmental factors and supportive factors, including immaturity of the gastrointestinal tract, gastrointestinal disease, congenital and acquired immunological defects. In these cases, the food allergy may be due to increased intestinal permeability to large molecules and the immaturity of the general and local immune response. The risk of allergies in infants is higher in children from families with a genetic burden. 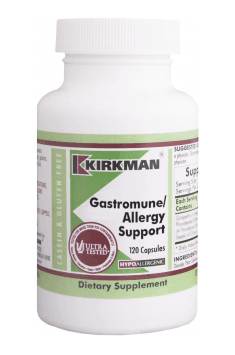 We differentiate food allergens that are more frequent and stronger, that is, those that more often cause strong reactions in the form of anaphylactic shock. The time from contact with the product until the onset of symptoms can range from a few seconds to several hours or even days. Abnormal reactions to milk occur in almost 20% of infants. Allergy to cow’s milk proteins is a disease almost exclusively of infancy and early childhood, and adulthood is a rare occurrence. Over 3 years of age, over 90% of children develop symptoms. There are cross reactions between cow’s, goat’s and sheep’s milk proteins, which is why milk of other animal species is not recommended for children who are allergic to cow’s milk. 2. Respiratory symptoms occur in 25% of children with cow’s allergy, it may be sapka, nasal blockage, sneezing, rhinitis, nasal polyps, sinusitis, exudative ear inflammation (common), tonsil hypertrophy, chronic cough , recurrent chronic bronchitis and bronchitis, bronchial asthma. 3. Skin changes in the youngest infants are rough skin, redness of the cheeks, so-called lacquered cheeks, cradle cap, itchy follicular lesions on erythematous ground located on the extremities, buttocks, genitourinary organs, in severe cases, the whole skin is occupied, the child is annoyed with persistent pruritus, and the skin changes tend to filter (especially in small infants) and bacterial superinfection. In older children, a typical location is elbow and popliteal folds, rupture of the ear lobes. 4. Nervous system anxiety, irritability, crying, problems with concentration, hyperactivity, sleep disorders. It is a common allergen in children. Yolk has much weaker allergenic properties than protein. Due to nutritional values, it is recommended to administer the yolks to babies after the age of 6 months. The egg yolk contains iron, phosphorus, calcium, magnesium, vitamins A, B2, B6, D. An infant diet enriched with egg yolks, prevents anemia, prevents rickets, so we are reluctant to eliminate them from the diet even if we suspect egg allergies, but we introduce them very carefully. With age, tolerance to egg whites (50% to 5 years) is produced, but this allergy persists for longer than for milk proteins and in adults it is more common than milk allergy. Fish meat contains very strong allergens. There are known cases of life-threatening shock caused by the introduction of a fish allergen into the skin during testing. Fish allergy is a frequent phenomenon in children and adults. Fish allergens are thermostable, the reaction triggers both raw and boiled fish. In a few minutes, fish intake may cause angioneurotic edema, urticaria, gastrointestinal symptoms, asthma attacks and anaphylactic reaction (shock). In very sensitive people, the mere touch and even inhaling the fumes of the boiled fish or the smell or even the kiss of the person who ate the fish, can trigger an asthma attack or trigger a different type of reaction. They belong to the same family and have pronounced cross-reactivity. Wheat proteins can cause three types of diseases: gluten disease, inhalation allergy, baker’s asthma, food allergy. Most of these allergens are thermostable, ie cooking, freezing or preserving significantly weakens their activity. Symptoms of allergy to fruits and vegetables are usually limited to the mouth and throat. The “fruit and vegetable” syndrome also known as the oral allergy syndrome (OA) is common in patients with pollen allergy due to the similarity of pollen and food allergens. Patients with allergy to birch pollen are often hypersensitive to fresh apples, peaches, carrots, pears, carrots and the scraping of young potatoes can trigger sneezing. Allergy to sage is often associated with reactions to celery, and bananas often show a cross-reaction to latex and kiwi. Spices and herbs, anise, chamomile, fennel seeds, coriander, cumin, chives, mint, pepper, turmeric, thyme, sage, lovage, lemon balm, soy sauce. Meat in children most often – beef, veal, chicken, in adults – pork, but also game, giblets, mutton. Among allergic diseases, food allergy is one of the most common diseases in infants and young children. The frequency of its occurrence is very different in different age groups. In children, food allergies are more frequent for cow’s milk and products of animal origin, in babies it is about 6.6%, in children aged 1-2 years – 3.9%, 2-4 years – 2.8%. In adults, allergies to plant products are more frequent. The diagnosis of food allergy can be determined based on the total elimination of intolerable food from the diet and a food provocation test, establishing a causal relationship between the consumption of a given food and the occurrence of clinical symptoms. The definitive diagnosis of allergy should be confirmed by a double-blind placebo-controlled trial. You can read also: Peanuts – evil incarnate ?